The giveaway included at the end of this post is now closed. But please keep reading because there’s a LOT of wonderful information here I don’t want you to miss! I am SO excited to share my new year’s resolution with you. And I’m SUPER excited about today’s giveaway (there will be 5 winners – sweet, eh?). So let’s get to it, shall we? 40 calories of fossil fuel are required to produce 1 calorie of beef protein. I am going to cook and eat less meat going forward. I’m not eliminating it, I’m not becoming vegetarian or vegan. But I am going to increase my consciousness about the impact my food choices have on the environment and try to do something about it. I’m going to buy more local produce and meat, probably even join a CSA. I’m not going crazy but taking it one step at a time. I want the change to be sustainable because it has to be. We only have one earth. This is one meaningful way I can help save it. What does this mean for you? Two things. FIVE lucky random winners will each win one paperback copy of Food Matters by Mark Bittman. I wish I could get a copy for each and every one of you. It’s a fast read with wonderful info and recipes. You can buy it here…and of course you should enter the giveaway by adding a comment to this post by Midnight PT, Thursday, January 14. Good luck! This would be great – I have his other books! Saw this yesterday at the book store. Interesting stuff. With my new baby and new expenses (daycare, oy! ), I’m motivated to eat at home more, both because it’s healthy and because it’s cheaper. Thanks for posting about this book, I’d love to read it and try the recipes. I’ve been wanting to read this book. I’ve been a lot more conscious of what I put in my mouth the past few years after reading some books and educating myself. I’m a lot more hesitant purchasing food that was grown far from home – especially produce. Thanks for spreading the word and for the opportunity to possibly…maybe…hopefully win this book! We went mostly vegetarian a few years ago for many of the same reasons and I haven’t regretted it. Still trying to switch my occasional meat consumption to more sustainable practices, but slowly working on it. We were part of a CSA when we lived in northern CA and it was awesome (we used a company called Farm Fresh To You). Sadly we now live in UT and are trying to figure out how to deal with the winter wasteland while still getting in our veggie and fruit servings. Anyways, I would love a copy of the book. Looks like something I need to read! I would love to read the book. My husband and I are also trying to eat less meat for many reasons-cost, environment, etc. So excited that you’ll be sharing (and experimenting) with vegetarian dishes this year. What a great step toward helping us all be healthier – including the planet. Also, really excited to see what you come up with when Farmer’s Markets are back in full swing in the Spring. Oooo. That’s gonna be fun! Check out cookbooks by Jeanne Lemlin (Simple Vegetarian Pleasures is my favorite), and Deborah Madison (Vegetarian Cooking for Everyone is AMAZING) for great meal ideas. yeah! I am glad you are sharing the book and giving away 5! Hooray. Great book! Would love to win. Thanks! So happy to hear, I swear just reading a few snippets here and there has prodded me to make quite a few changes, including doing more vegetarian, which is often cheaper too, so excited to see your recipes – although still planning to make your meatballs, and the beef/chestnut/red wine stew from Greedy Gourmet. Would Love to read this book. This sounds like a great read…especially if there are recipes in it too! Awesome! Good for you :). Your resolution sounds almost identical to mine this year. Less meat, more whole foods, and be much more conscious about where my food is coming from. I’m actually even going to try growing some of my own. Thanks for the chance at the fun book giveaway! Always on the lookout for great cookbooks. I would like a chance to read this book. Thanks! What a fun week for giveaways! You are too nice. I would love love love to win this book! We are a part vegetarian family and really focus on healthy eating. I was a vegetarian for 14 years and have been contemplating a move back. Hmm. Perhaps this is the year. I would absolutely LOVE to read this book. Michael P.’s book – the Omnivores Dilema really changed the way I viewed food and where it came from. I love these types of reads and would devour every page. I’d love to win this! I really, really like his cookbook How to Cook Everything Vegetarian. I have the same resolution — less meat! I would love to read that book to help me stay on track. I have decided that once a week (at least) we will eat a vegetarian meal….all of us….even my two little boys. This should be fun! I’ve been looking into cutting down on my meat consumption for 2010 (and future) also, this would be a great kickstart to that goal! It’s hard to do when you live with 2 mid-20’s guys who eat meat all the time! Sounds interesting. My nutrition major roommie would probably find it completely fascinating. I’m so excited to have found your blog! I was a veghead for about 8 years but now am more of a flexitarian. My family has been doing Meatless Mondays for a while and love the difference makes on our health and the enviroment! Looking forward to reading more on your blog. Happy New Year! I like your blog Jane- this is the first time I’ve really read it. Good stuff to think about! Love Mark Bittman’s stuff and hope to win a copy! I can always use a new cookbook! Meat grosses me out. I can eat it, but preparing it is another story, which is why we rarely eat meat and I need recipe ideas. I love Mark Bittman too. First time at your blog. Think I’ll be back. Jane, It was delightful for Julia and I to meet both you and Nate and your darling daughters. I leave this comment in a shameless attempt to assist Julia to become one of your five winners. By the looks of this posting, you do a very nice job with this blog. Well done! This is one that I haven’t read yet, but I really want to. I read Animal, Vegetable, Miracle and was really inspired by that. We started our own garden last summer and I hardly bought any vegetables because we had so much. We’ve definitely gone away from eating meat every day. Thanks for the giveaway! I’d love to win a book! I’m trying to eat less meat as well and would love to learn more and get some new recipes! Thank you Jane, you post is really motivating to me! This year I want to take steps towards more substainable eating and living, I’ll definitely look into getting this book. I just finished reading Michael Pollan’s book “In Defense of Food” and I’m already making some changes. I’d love to read this book as well, especially with recipes! I came to your blog via the Pioneer Woman – it’s great! I’ve just started really buckling down and doing weekly meal plans myself so your site will, I’m sure, give me lots of great ideas – thanks! I’ve been wanting to add more meatless meals to my life. It looks like I just might have to join you in this journey! I can’t wait to see what you come up with. Looking forward to reading the book – whether I win or not! Thanks! interesting. I’d love to read about it. Not just healthy but sustainable – YUM! I would love this. Love Bittman and Pollan and I would love some practical advice from this book! Love it! Many people in my family could stand to read this instead of me just telling them. I just read about this book online… Thanks for hosting this giveaway! This looks like a wonderful book. The sentiments in your post resonate very strongly with me. I too am looking to eat less meat and work on expanding my consumption of whole grains and legumes. I recently experienced a health wake up call that has changed my priorities with food. I am a foodie at heart, love to cook and eat good, wholesome and unique food. This book seems so appropriate to help me through a new healthy food adventure. I am excited to learn about this book and prior publications. I will look forward to it one way or another. Thank you! I would like to eat healthy this year. Thanks for the offer of a great book! I am VERY excited about the changes you are making because I want to make some of those very same changes. I just read about his book earlier this week…would love a copy! Thanks for all that you do! I am the counselor in an elementary school plagued by generational poverty and its effects. I spent my summer reading Michael Pollan’s work and others so that I may add current information into my classroom guidance lessons aimed at children who are mostly familiar with school lunches and fast food. I’d love to add this book to my resources! I love this message. I’d be happy to win so I could read and then share with someone else! Wow, I am on a journey of losing 92 pounds after being misdiagnosed with MS and being on medication that caused my body great damaged. I am looking for new clean recipes that will help me get fit from the inside out! This book looks like it will get me on my way. Thanks for the article and the chance to win! I’m making the switch to less meat. I’d heard Bittman interviewed about this book, would like to read it. I used to be vegetarian, then vegan, then I got pregnant and craved buffalo wings. Ouch. But, now, our family rarely eats meat and what we do eat is purchased from Whole Foods, so I know it’s pretty darn good. I would LOVE to read the book you’re giving away, as I would like to start eating healthier again and being more conscious about what my family eats. Love, love, love this concept! We rarely eat meat mainly because it is so expensive but I would love to cut down even more to do my part to diminish my footprint. Can’t wait for your vegetarian recipes… and would love a copy of this book! I need this book! Need to cut down on the meat and need some help doing it! I like Michael Bittman since he did that “On the Road Again” special (PBS) with Mario, Claudia and Gwyneth..cool…. The book sounds super interesting. I would love to read it! Thanks! This book looks fab. Thank you for hosting the giveaway. Thank you for the contest! I hope I win and if someone else does, Congrats! I won’t be giving up my meat, but I am always looking for more meatless and low-meat ideas. My resolution for this year is starting to can beans, so I have them on hand at all times. Thanks for the giveaway and promoting this book. I would like to eat this book! His “How to Cook Everything” is THE cookbook in my house and I pretty much trust his word over most. I would love to read iT! What a great idea!! Start small, eat responsibly and consciously. Thanks for the inspiration. By the way, I have a FAB recipe for pesto tortellini soup–easy peasy AND vegetarian. Email me if you’re interested. I look forward to his column every week in the Times. Sounds like I could learn a lot from his newest book. I have heard so much about this book. I’ve made several goals this year that are in line with the thoughts of your blog and this book- oh I hope I win! I would love to win this cookbook–thanks Jane! One of the funniest things I’ve ever heard was a discussion where Paula Poundstone was trying to convince Pollan that Ho Ho’s (or some such snack) definitely should count as “food”. Sounds wonderful! You can count me in on the giveaway. I am very interested in this subject matter- thanks for the article and book suggestions! I would love a chance to read this book!! Id love to read this book. My sons are athletes and Im sure feeding them in this matter would benefit them greatly. I could use this book!! Interesting post. I would be very interested in reading this book. I have just finished, Eat to Live by Dr. Joel Fuhrman. He encourages the same lifestyle to protect our bodies from disease and to achieve a healthy weight. Over the past few months I have cut meat out of our diet to a huge extent. I would love to have some more vegetarian recipes. We switched to be vegetarian last year and love it! We have yet to miss meat. Our grocery bill has decreased significantly we feel so much healthier and we have made our carbon footprint so much less. I’m so glad to hear you are going to do your part. Definitely people KNOW these things, but they need to actually put that knowledge to use and DO those things. Great giveaway, Jane! I’d love to get my hands on a copy! It’s a goal of mine to get back into meal planning this year! So far so good. I’m totally on board with Mark. I would love to see the recipes in the book. I have dabbled here and there with being a veggie…. it is a complicated decision though. Heard great things about this book, thanks for the chance to win!! I think this is one of the best resolutions I have heard in a while. We don’t eat alot of meat and have aleast oine vegeterian dish a week. Knowing otherways of being environmentally friendly is great. Would love to win this book. Have been looking into the things this book brings up for a bit, would like to get the recipes and see what they consist of. What a great giveaway! Thanks for the opportunity to enter! Great post, great articles, and great book. I found your post through Michael Pollan’s twitter updates. Can’t wait to explore your blog more. I admire Bittman’s “vegan before 6 [pm]” regime. Recently I read Michael Pollan’s In Defence of Food which opened my eyes in the same way that you describe being affected by Bittman’s book. Since then I have been trying to eat less meat, and mostly organic (which comes out at the same amount of money spent on meat because the organic stuff is so much more expensive!). Thanks for your interesting post. I’d love to win this. Same resolutions as you–great post! I love Bittman’s Cook Everything cook books. I am very interested in this Food Matters book! Have you read Animal, Vegetable Miracle? Love it too. Amen! Excited to see what the next year holds in store. It will be a fun read. My husband was just reading an article in the newspaper this morning about the practice “plumping” chicken meat. It was pretty dang nasty! I’d be interested in reading this book, and good for you for making positive changes! After eating my way through the holidays, this is a book I could REALLY use! My New Year’s resolution is to eat healthier, so this book would be a big help!! Joel Salatin, one of the big names in conscious eating and farming, lives about 30 miles from my community. We have been really aware of how we eat and are working on doing better. I also love “Animal, Vegetable, Miracle” by Barbara Kingsolver. I hope you enjoy this journey. Eating organic, locally grown, pasture raised food has been a wonderful exciting thing for our family, but I know we can do more! I’d love a copy of the book. We already have, How to cook just about everything vegetarian also by bittman, but always looking for more. Keep meaning to read this! Would love to have a copy! Yay for new years resolutions! Very interested in incorporating this in our cooking! Thanks. Pick me and it will feel like Christmas all over again. Can’t wait to follow your progress, I have the same resolution but it’s hard to find recipes without processed foods in them. Good Luck! I made a similar goal mid-way through the year in 09. We’re doing a little better, but still eating more meat than I think we should. I try to cook vegetarian some, like the time when I replaced our beef with mushrooms….my husband said, “it’s good, but where’s the meat?” He’ll eat it and not complain, but I know deep down he’s really sad about loosing the meat. Thanks for the giveaway! What a great book to get you motivated for some good, healthy eating! As a HUGE meat eater, married to a loyal Jane Maynard fan and fellow traveler, my heart sinks a little upon reading this. But, alas, truth is on your side. I salute you. not feeling hopeful with so many other comments but anything to support my friend Jane. Well sign me up, I’d currently like to learn more. Just got it from the library yesterday – looks great, and I would LOVE to own a copy. So excited about this direction for your blog Jane! I share a lot of these feelings. This is just what I’ve been looking for! Hope I win!! I would love love love to win! My fingers are crossed. Eating less meat was my (successful) resolution last year and I hope to take it down another notch this year. I’d love to read this book – thanks! ooo… I’d love this book–looks interesting. I love all his books, i’m so excited for this one! This is a topic I’ve found myself getting more and more curious and passionate about. Looks like a great read. Thanks! Interesting. I have been trying to eat meat in moderation and adding more grains and veggies to my diet. It sounds like I need to read this book for tips! This sounds like a great book … I’d love to read it! I’m excited for the ~ 1/30 probability of winning. I’d love a copy of this book!! I would love to see what recommendations this book has for us! Enjoyed your adjusted approach to dining. am very interested in the book. thanks for the info. The book sounds excellent – I’d love to eat more healthily AND more sustainably! Thanks for the great recipes! I’m an Aussie living in Canada and only just started reading your website in the last couple of weeks, but I’ve already made the Baked Stuffed Winter Squash (also added bacon and pine nuts) – yummy! what a great resolution! good luck on your voyage! I’ve really been wanting to read this book. A friend and I joined a CSA last year…it’s awesome. Even my kids love more veggies, more often! I really like Mark Bittman. I have his book How to Cook Everything Vegetarian and have tried cooking more frequently from that the last year. I’d be interested to hear what he says in this book as I have been trying to make an effort to reduce our meat consumption. I would love to read this… it would be put to good use. Sounds like a very interesting and eye opening book. Thanks! I am also trying this same lifestyle change. Other books along these lines I could recommend include Omnivore’s Dilemma and Animal, Vegetable, Miracle. They certainly inspired me, and I’d love to learn more by winning this book and having an opportunity to add to my knowledge. I look forward to seeing your posts as the New Year continues. I’ve been thinking about making similar changes to my family’s eating habits. I’m glad to learn with you! I am excited to see more veggie menu ideas. We also eat very little meat. I love How to Cook Everything and will visit the library for Food Matters. Michael Pollan changed my life – I’ve never thought the same about since reading The Omnivoire’s Dilemma. I highly recommend it, although it is quite long it’s an amazing perspecitive. would love to read this book. my resolutions for 2010 also include healthier, more local eating and cooking. I have his other books and have read about this book in Runner’s Magazine. It is a great book and he lost weight by eating less meat. I checked this book out from the library but had to return it before I finished it. Cool giveaway- thanks! I have been thinking about changing the way I eat- but can’t commit to going totally vegetarian. Read an article by this author and was really motivated to find out more- would love to read his book and try the recipes! Love, Love, Love it……have, have, have to have it……cooking is my passion!! I’d love to read it! Unless I win it 😉 I’ll head to the library soon to check it out! This book sounds right up my alley. I would love to check it out!!! Hmmm… this is something I would like to know more about. Sounds like a great book. We’ve been surprised at how little meat we need to get in order to have a healthy amount of protein. Go figure! That sounds like a great resolution, I am definitely going to have to look into that book. This is definitely something I am interested in reading! Great idea all around. I’m on board! Sounds like it’d be a good read. I would love to win this book & if I don’t I will def. buy it. IMy family is making small changes this year too & we just joined a CSA for the summer. Mark Bittman’s “How to Cook Everything Vegetarian” really has changed the way I cook (and thus how my family eats!). I hope this book is just as helpful. Good luck to you in the New Year! Good luck on your resolution. Thanks for give away too. It seems like a great book! Sounds like a good book to read. It’d probably be helpful in our journey to being healthier. This book is on my list to read. Good luck with your resolution! I’m very interested, and want to be a more conscious eater. I’m doing a wellness challenge starting monday (hey, want to join? You don’t have to be local, though my neighbor’s the one who started it) and I want to really change things up. Thanks for just another reminder why it is good for more than just your waistline to eat whole foods. Oh, here’s the link to the facebook group about the wellness challenge. It should be a lot of fun. The more who join, the merrier! Bittman is great, and I’d love his book on my shelf. Thanks so much for the giveaway. I’ve been toying with the idea of reducing meat in our diets, too. Just have to get the husband and children on board. Actually, it’s mostly hubby since the kids rarely eat dinner, anyway! I love Bitty! His book ” How to Cook Everything” is my go-to reference book. Sounds awesome! i would love to get my hands on a copy! Eating is getting so hard…and yet so much better at the same time! Having that book would be great! One of my goals for the year is to shop at the farmer’s market at least once per month. TOTALLY off topic but I was looking for an online site that helps with meal planning…actually one that offers a template that I can access via online. I found this site and it offers an Excel spreadsheet that I this is great! Just thought I’d share! Looks like a great book. Sign me up! Maybe #200 will be the lucky number! I would LOVE to win that book! I cut soda and juice (except for natural) and fast food out of my diet. Holy moly! Comment 203 … this sure started a discussion. 🙂 I was a vegetarian for seven years — between my junior year of high school and first year out of college, but then eased some meat back into my diet. We still eat vegetarian a few nights out of the week, though. Can’t wait to see you explore some new recipes; I’m always looking for meatless dinner ideas. Here’s a recent one that we LOVED — a savory bread pudding with butternut squash: http://teamomdal.blogspot.com/2009/12/butternut-squash-bread-pudding.html. I would love to eat more vegetables, but I just don’t really like them. I am going to try to incorporate more into our daily meals though. Even if I have to puree them and trick myself. I’m always looking for a good read– and this sounds great. I’m looking forward to your vegetarian recipes– I like to cook meatless at least a few times a week. This book is great way to embrace mother earth. My family needs to eat more vegetables. I have not read that book yet, but I really want to. I’m looking forward to recipes that you find. My bf and I definitely are not vegetarian either, but meat is not one of the requirements in our meals. Thanks for thinking of all of us! Looks like a really interesting read. I’ve never thought about the eating “less” meat theory. I need to get in shape and eat healthier in the New Year. Hopefully this will help!!! I’d love this. I’ve been doing a lot of reading about food and the way we eat–I love The Omnivores Delimma and just recently started The United States of Arugula–there is so much more to why we eath the way we do than I ever would have thought. I am with you, Jane. I do feel like I need to examine this issue. I have some of Pollan’s work and want to make changes. But, as with all difficult things, find myself dragging my feet a little and wondering how to go about it. Thanks for the poke in the right direction! I saw an interview with him and thought he was brilliant. I would love to read his book! And I commend you for taking this step. Hopefully your blog will inspire me to do the same. I try to go meatless whenever I can, but sometimes I slip back into the mindset that meat has to be a part of every meal. Kudos! We made this same resolution about 6 months ago. Congratulations on your new food stance! I’d love to read his book. It’s not one I’ve read. I would LOVE to read this book. We’ve been slowly cutting down our meat consumption over the last year; I can’t wait to see how you do with it! Thanks for publicizing your new approach to eating less meat in a healthy, earth-friendly kind of way! I reAlly want to read this book! I’ve been gently “preaching” some of these ideas to my husband who is trying to live more “green”, but he just scoffs at this! Now I could show him I’m not totally crazy!! I’m so glad you are going to include more vegan recipes on this site. I’ve only just started meal planning about four weeks ago but i’m seeing a difference in my finances, my waistline and my sanity — all good things I should say! 🙂 I’d like to go meatless once or twice a week but I need ideas. I look forward to what you share with us in the future. Also, I’d love the chance to win the book too. Thanks for the great offer! Very interesting, great resolutions! Thanks for the giveaway. Got here via twitter…I love your blog! Thanks for the chance to win the book. YES! perfect for my new resolutions this year…and this year I AM serious:) looks like the perefect read. You have me very intrigued by this book! Hope I win! Would love to win this, thanks for hosting the giveaway! I like that idea! I don’t think going vegetarian is an option, but I do like the idea of feeling like i am doing my part to be healthy and help the environment! thanks for the giveaway too! Good for you for inspiring all of these other cooks! Can’t wait to see how some of Mark Bittman’s recipes fair on this blog. Currently working towards a master’s degree in nutrition, strictly following vegetarianism for years, and inspired by films such as FOOD, INC. and Ingrid Newkirk’s I AM AN ANIMAL and books like BECOMING VEGAN, I would love to delve into Mark Bittman’s FOOD MATTERS! Thanks. Sounds like a great book,and a great resolution! I started observing Meatless Monday about 7 or 8 months ago, and it’s been fantastic! Much easier than I thought it would be, and I’ve really enjoyed the challenge of finding really satisfying flavorful vegetarian dishes. Happy eating! Looks like another great cookbook. Adding it to my Goodreads “To Read” shelf! Love the resolution. As a former vegetarian, introducing meatless dishes to my husband has been nothing short of a failure. What I have done is eat vegetarian throughout the day with the kids and have meat in our dinner meal to fill him up. We also repurpose any leftover meat from dinner so that every bit gets eaten. I’m big on less waste and using everything that we have. We joined a CSA last year and loved it. It was a fantastic experience, and I can’t wait for our first box to come in the spring. My husband and I eat only about 2-3 servings of meat every week for your very reasons listed. I would love to read this book and learn more about Mark’s perspective! What an absolutely fabulous idea. I don’t actually need a copy of the book as I already purchased it, but I wanted to thank you for trying to come up with more sustainable recipes. I have been trying to do the same thing and reducing meat is difficult simply because we are used to it, or bigger reason, my husband is. I was nearly vegetarian for a number of years and if I could find a way to get somewhat back to that it would be great. Sounds like a great book, I hope I win this copy! As a long time menu-sharer, you may have noticed we don’t eat an excessive amount of meat. We started eating less meat a couple years ago, and the more I read and learn about the state of our food policies in this country, the less I end up eating it. We started out just cooking with it less, and have moved on to buying local grass-fed meats or organic meats when we can’t get what we need locally. Because these products cost more we eat even less meat now, but feel much better about it when we do. I’ve been a fan of Michael Pollan’s for many years now, and definitely recommend his books on this subject. Food, Inc. was also very eye opening, not just on the meat issue, but on the food industry in general. There is also a good video of Mark Bittman on TED discussing the topics in his book. Happy Veggie New Year! I would love to read this book. I am reading the omnivore’s dilemma now. Thanks! This is the direction I’m hoping my family will agree to go this year… Sounds like a great book, and good luck with your resolutions! Thanks for the giveaway! My friend is trying to convert me to eat whole foods more and thinks this book would help in my “eat better” journey. Am enjoying your blog as I’m a newbie here. Thanks. Fantastic! This is similar to our new years resolution. We are trying to have meat less each week. Last year it was Meatless mondays. We are amping it up 3 days a week now. Thanks for bringing this topic to my meal planning. I now have another reason to eat tortollini! I’m eager to read your progress regarding your resolution. We, too, have drastically cut back our meat intake. Honestly? We feel healthier, and we’re happy to be doing our part for the environment. When we do eat meat, it’s local and sustainable. I’ve found that eating less meat really forces you to be more creative in the kitchen, which, for me, is a good thing! I’m always looking for ways to cut back on meat – looks like a great book! Looks interesting. I would love to give this a try as well. I just discovered your site today, and I am thrilled – it sounds like you are on the same eating path that I am on. Now just to convince my meat loving husband that maybe a little less will do 🙂 Thanks for some great ideas. I’ll definitely be checking in. Two of my favorite things – healthy food and the planet! Ooh I’d love the book. I feel like I am in a food/cooking slump these days. Thanks! I have been trying to implement one meatless meal a week for our house but meeting so much resistance from my hubby. Maybe I can convince him if he sees it in writing from someone else! I love books books books. I have all of Mark Bittman’s books but this one so I would love to have it. I recently became a lessmeatarian but didn’t know it had a name. It IS a slow process, but a good one. I already feel better. This book looks really interesting. I would love to read it. I have been trying to eat and cook more healthfully, and would love this book! I eat gluten free and this this book would be very helpful. This is an inspiring idea, thank you for bringing it to the attention of more people! I have been wanting to adjust my family’s diet for awhile now – this book would be a great way to convince my husband to jump on board! We have been making changes for the last several years. Making small changes along the way have amounted to some big progress now. I loved this book and I would love to have my own copy. I got mine from the library (an old resolution from 2003 – do not buy any more books, use library) and I would love to have this as a reference for recipes. Jane, come on. I’m like the best vegetarian you know. And you love me. So let’s do each other a favor here. P.S. I feel this is an appropriate forum to let you know that I am coming to visit you with Anne over Presidents weekend. If you’re not home, just leave a key. We’ll watch the house for ya. I never thought of it as you have described. It isn’t just about the question is meat good for my body? but it also has to do with is producing such large quantities of meat good for the environment? I love the idea of eating less meat. I would LOVE to read that book. Thanks for spreading the word, slowly but surely we all CAN make a difference before it’s too late! Love your blog! Totally interested in this stuff. Would love a copy of the book. Love Mark Bittman. Worthy less-meat goal for health AND environmental reasons! Sign me up! Happy New Year! Love your blog! Would love the book too! yes please…i’m on board too! i would love this book. already have reduced eating meat just because as i have gotten older, i don’t want it as much. the problem is that i now have a one-year old and she LOVES meat. aaron needs to read this. hook me up. Okay, you win! I am interested. I just went to a “health numbers” class, that said basically the same things. I would love to read this book. And, then, ofcourse share the information with my husband! this would be so great as we are trying to eat less meat and more vegies. I love the Moosewood books – too bad my ex kept mine! Definitely sounds like something I need to own. I was brought up in household where meat was consumed once a week at the most. As I grew up and moved away, I started eating more meat, more often. I have been cutting back on meat for the last year or so and we now go days without eating meat. I dont even think of a day being a ‘meatless’ day…i just dont buy a lot of meat and if there is none of it at home, i am not going to cook it! I was just talking to my friends about this subject yesterday, what a coincidence! The cookbook sounds awesome. just found your blog and love it already! adding it to my google reader. and I was needing a swedish meatball recipe for this week, so happy to come upon yours, looks amazing!! thanks! I think Mark Bittman was on PBS with Gwenyth Paltrow, some Italian gal, and an American chef – I;m bad with names! They traveled through Spain and ate along the way. It was an excellent show! Anyway, I’m interested in eating healthier – diet is 80% of one’s fitness – and I have a vegetarian daughter so I need more vegetarian recipes! I’d really like this book, if not for me, for her! Thanks! I love his columns in the NYT. Love vegetarian though I doubt I’ll ever give up meat again (did for 3 years many years ago). Find Pollan interesting and would love to see what Bittman has to add to the discussion. Ooooooo…. just in time. I would love this. Right up my alley. Sounds like a good resolution. Totally agree with you, and will have to read this book, one way or another. Thanks for your wonderful tips, Jane. 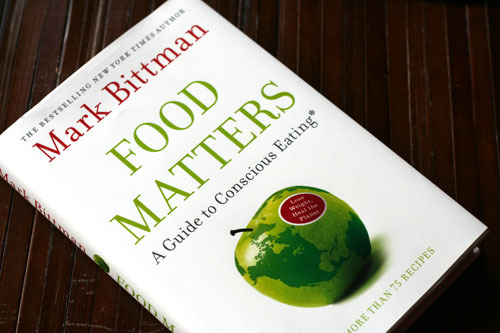 Have been reading several books on this topic and would like to here Bittman’s take. I’m a fan of his NYTimes Minimalist postings and his vegetarian cookbook. Thanks for offering these! I’m trying to do the same. I cook less meat, and I try to buy only humanely raised and organic meat when I do buy it. Would love to read what Marc Bittman has to say – I’m a big fan of his. And I’m enjoying your blog a great deal — just started reading it. This is great food for thought. As the mom of 3 little ones, I try to make our food choices conscious decisions. Love your blog, check in daily. Keep up the great work! I’m lucky to live near a dairy and farmstand so that I can purchase dairy products that are produced within two miles of my house. A good diet tip is to eat consciously. Be aware of what you’re eating. I love the Minimalist column in the NY Times. I am also trying to reduce meat. I’ve been reading and learning about Raw Food Diets as well. I would love to win a copy of this book. I recently did a detox and so far have had minimal meat in the past two weeks. Good Luck with your lifestyle change!